ANAHEIM, Calif. -- Playing with a sore hand and a banged-up left leg, the Oakland Athletics' Jed Lowrie would be the first to confirm that winning ugly is way better than losing. "It becomes more of a Who's fresh?' game than a matchup game with the bullpen," Scioscia said. "You try to do your best to put guys in good spots, but right now we're not there. We're looking at whoever's available to give us innings. We try to line 'em up as best we can, but we're not as efficient as it is if you have the functionality of having starters get to a certain point in the game, which right now we just don't have." 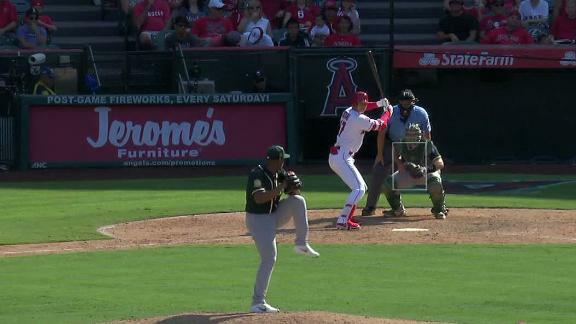 Shohei Ohtani takes Jeurys Familia the other way, hitting a single to left-center field and scores two runs in the 8th inning.